June 20th was “Meet the Artist” day. I had sent out 38 invitations to residents around the pond, and along Pond Road, to join me at the canoe landing site. This seemingly simple project had unintentionally struck the nerve of some residents, largely due to the ongoing discussion over the hunting use of surrounding New York City-owned land, and the fear of increased traffic and possible damage due to publicity. At the same time, it has received support from residents who have many stories to share. Over the scheduled two hours, about 15 residents stopped by, making the event a lively gathering. There were greetings among old friends and first-time introductions. The conversation ranged from beaver activities to legal issues. In the end, the ambivalence about the project still seemed to linger, but there was overall a general good feeling about being there together. 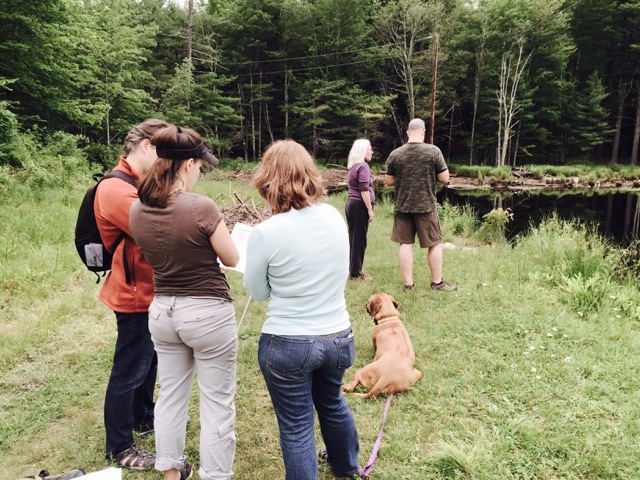 I appreciate everyone for coming out, and hope to keep fine-tuning this project for the benefit of the community and the ecology of the pond.